Last updated September 20, 1996. This page contains links to information about the Aurora aircraft. 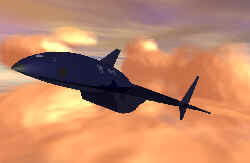 Rumor has it that this plane was developed to replace the SR-71 aircraft. It is supposed to be able to fly at Mach 12. It's sonic booms have been recorded in the Nevada desert, and it has been sighted off an oil platform in the North Sea. If you have links which should be added to this page please e-mail me at [email protected]. Aurora Summary From Knowledge Adventure: A good, concise, summary of the Aurora and the background for it. Aurora from FAS Intelligence Reform Project A great document, it contains much of the history of the Aurora. Aviation FAQ Part II: This section of the aviation FAQ has some more detailed information on the Aurora. Photo Gallery Some pictures of Aurora. Have any others? Send 'em in and I'll put them up. Aurora Time Line Key events in the Aurora's history in chronological order. The Official SR-71 Page An article by Art Hanley with his opinion on why the SR-71 was canceled, then brought back into service. WARNING: The government is supposedly testing the Aurora at Area 51, also known as Groom Lake, a "secret" air-base in the Nevada desert. Some people claim that this air-base also houses the remains of a crashed UFO. So some of these articles are a little off the wall and are very "alternative." Area 51 page in Psycho Spy: An excellent index to all kinds of information on area 51. Area 51 FAQ: A good overview of issuses surrounding Groom Lake (Area 51). TV News story on Area 51: Broadcast on KLAS Television (CBS-Las Vegas) on 10/11/95, in the 6:30 newscast. Government secrecy page: A good site about issues having to do with (what else) government secrecy. Strange Document Mentioning Aurora Excerpt: The Aeronautical Systems Center is proud heir to a long tradition of aerospace research and development dating back to the Wright brothers. Now the B-2 stealth bomber, the F-22 Advanced Tactical Fighter, and the Top Secret Aurora are proud additions to Wright Field's tradition of aeronautical innovation.